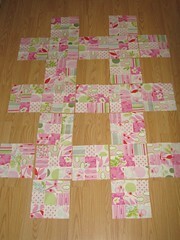 So I finished sewing all my blocks and I have 6 extra (in addition to the 4 that go on the back). I can't decide whether to add them to to the front, the back, or save them for something else entirely. Decisions, decisions! I've finished sewing the rows, but I still have to sew all the rows together. I'm liking the linen with this. This looks great! OK, and you just started sewing this year?!?! (saw that in your side bar). It's sweet and girly . . . for you? for sale? you could totally sell it on Etsy when it's done! Thanks Vanessa! I may end up selling this one on Etsy. I love it, but how many quilts does one person need? I'm not really interested in having a business. If someone covered my costs, I'd be thrilled! arg. Just remembered this is OhFransson's pattern and I can't sell quilts made with her stuff. Darn.